Hey everyone! I’m excited to announce that I was able to win my second Regionals of the season, and second ever, this past weekend in Denver, Colorado! Normally I would review the entirety of the Day 2 metagame and the state of the event, but since I won I want to use my own unique perspective to talk about my event and how things looked. Going into the tournament I expected a lot of Pikachu and Zekrom-GX decks, along with Zapdos. I thought Zoroark-GX builds would die down a little, as would Malamar. Blacephalon-GX was looking like it might see a little play, as well as stall decks based around Lusamine. 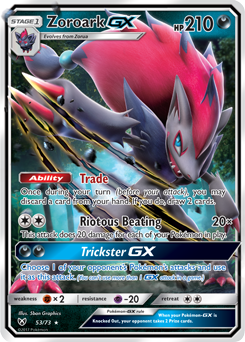 With these decks in mind, Zoroark-GX / Control was reborn and prepped for the event. I played only a handful of games with the new list in the days prior, but I knew I could play it well with past experience using other control variants, especially with Zoroark-GX. One of the best things about this list is its ability to crush Zapdos decks to a pulp. A larger Alolan Muk line than usual is instrumental in pushing the matchup greater in your favor. It helps you find it sooner and survive an early Alolan Muk Knock Out that your opponent may be lucky enough to take. The two Alolan Grimer almost ensures that you can get the turn two Alolan Muk down since Zapdos players will be targeting Alolan Grimer or Ditto Prism Star on their first turn. One of my favorite openings was to find Alolan Grimer, Ditto Prism Star, and two Zorua on the first turn to prevent my opponent from being able to eliminate the threat of Alolan Muk altogether. If Ditto Prism Star is in your Prize cards, you can find two Alolan Grimer instead for the same effect. 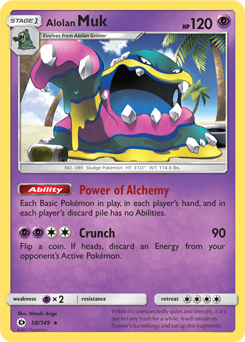 Alolan Muk’s Power of Alchemy is one of the most degenerate Abilities in the game right now and is downright dirty against Zapdos decks that rely so heavily on Jirachi. It was great against Lusamine / Control decks that have a variety of ways to stop you from dealing damage with attacks, to which you can turn off those opposing Abilities and be able to damage opposing Pokemon once more.